Service dogs aren’t just good boys, they’re the best boys. From helping those who live with autism and are prone to fainting spells to cheering up sick kids at a Los Angeles children’s hospital, these adorable service dogs are the cutest around. Did you know some service dogs can help warn their owners when their blood pressure is spiking? 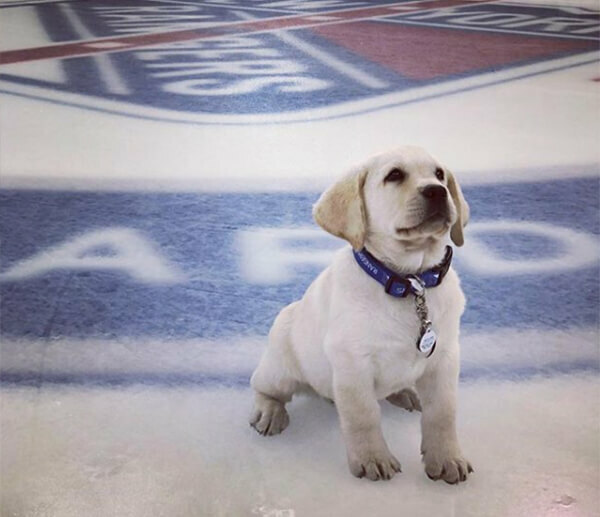 Playing on the New York Rangers isn’t just a job for humans. This helpful pup was welcomed to the team as an autism service dog. Ranger, a 6-month-old yellow lab, will join the team for a year to help him learn all the skills needed to care for a child with autism. The adorable doggo is part of a group known as BluePath. He and a team of other adorable pups help people all the time. If that doesn’t melt your heart, nothing will. Rangers’ spot on the team comes from a partnership with BluePath. The nonprofit provides service dogs to those suffering from autism. 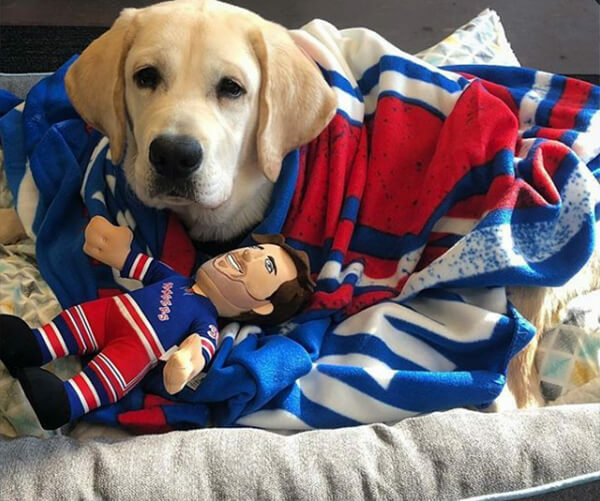 “We are so excited to partner with the New York Rangers to raise understanding and awareness for autism and of the importance of service dogs in the world,” Michelle Brier, BluePath’s VP of Marketing and Development told Us Weekly. The pup has already launched a too-cute Instagram that’s amassed over 24,000 followers. Most recently, he was spotted practicing with his teammate Kevin Shattenkirk and chilling on the ice. How cute is he? Bandit has an important job. This pit bull can smell whether or not his owner’s insulin is dropping or spiking. How does he do it? Humans release a special scent when their insulin levels drop. Diabetes alert dogs are trained to tell their owners when this is happening thanks to their killer sense of smell. Bandit is part of a pretty big family of pups. He’s got a human little brother who’s his very best friend and enjoys outdoor activities and travel. 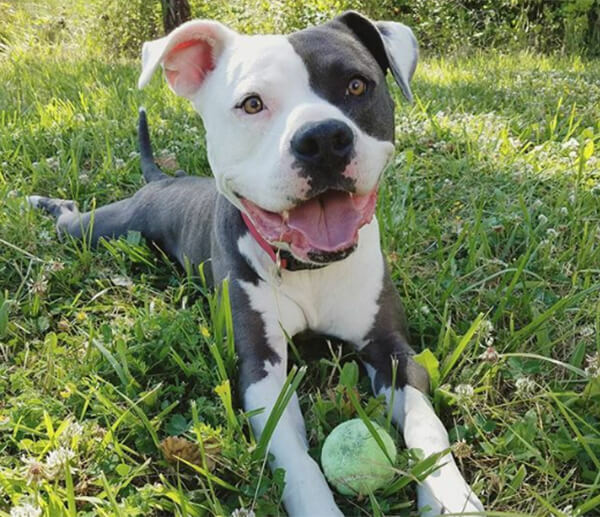 Bandit has a hobby of kayaking and hiking but also enjoys relaxing with a chewed up tennis ball. This pup is a certified good boy. Service pup Chester provides emotional support when his owner, Max, is dealing with sensory overload. Chester isn’t your average pup. 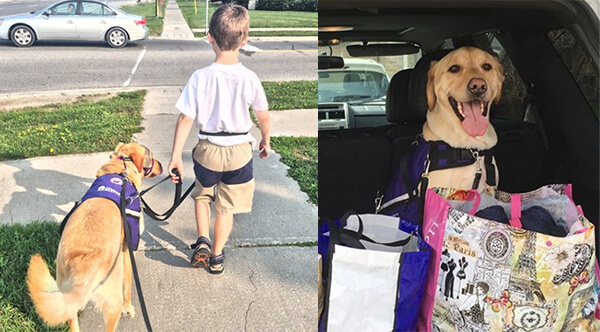 This service dog helps a little boy with autism. Max spends every second with Chester, who does a whole lot more than just offer emotional support. Chester serves as a focal point to ground Max when he’s suffering from a sensory overload, a common challenge for many people suffering from autism. When Chester isn’t working, he’s just like your average pup. He likes to help his mom with craft fairs (check out all that yarn he’s hanging onto in the back seat). He also likes to snuggle with his siblings – be it human siblings or cats. If little girls look up to Disney princesses, little pups look up to Disney dogs. 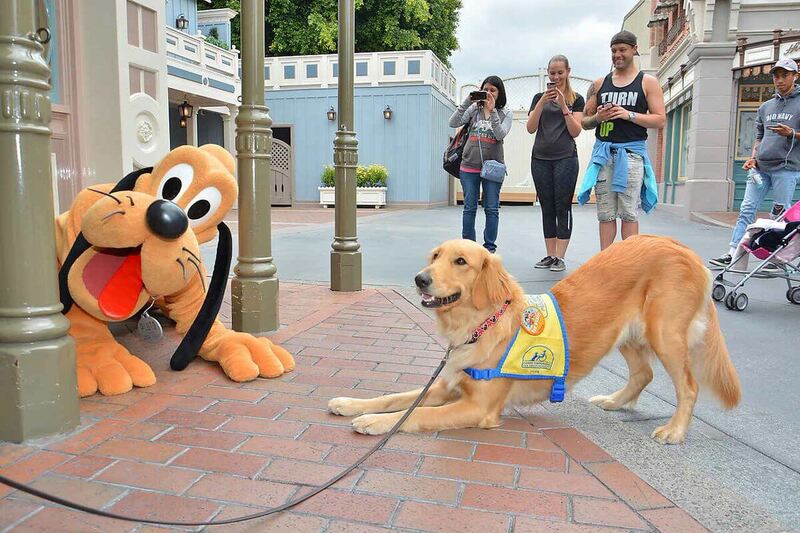 Marni, a service dog in training, had the thrill of a lifetime when she met Pluto at Disneyland. The adorable pup was so excited she ran around that Disney icon, jumping up and trying to play. Marni is part of Canine Companions of Independence, a nonprofit that breeds and raises service dogs. The dogs regularly take field trips to Disney as part of their training to help them properly socialize. During her trip, Marni also got to have a few tummy rubs from Daffy Duck. If you’re a service dog, being away from mom and dad can be extremely lonely. 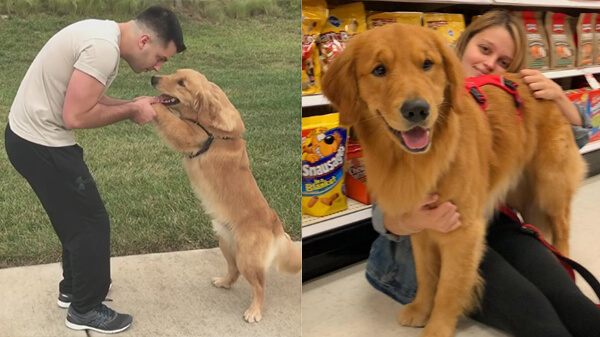 For King Henry, a Nashville-based service pup, getting reunited with his favorite human was almost too much to handle. King Henry’s father is a member of the military and was deployed to help hurricane victims. While his dad was away, he was helping his mom — who can faint because of low blood pressure — with tasks like shopping and navigating crowded places. The second he saw his dad in the parking lot, he ran up and started covering him in kisses. What a good boy! This next sweet pup spends his days volunteering at the Children’s Hospital Los Angeles. Look At Norbert’s Little Tongue! Before Norbert became a therapy dog, he was a little puff of brown fur. Today, the tiny pup is snow white and has the cutest little feature – his tongue is always hanging out of his mouth. At 7 years old, he weighs just three pounds, but that doesn’t mean his job is any less important. Good things come in small packages. Finnegan McNeil is a big hero in a tiny package. The toy schnauzer was just two years old when he became a service pup for his hearing-impaired dad, Steven File. Finnegan’s important duties include alerting his dad about all the sounds we take for granted – sirens, alarms, doorbells, and someone coming into a room (you can never be too careful). The smart pup has learned about the context of which alarms are important. He won’t alert his dad for sirens roaring outside the home, but will let his dad know if a siren is approaching when they’re driving in the car. Finnegan’s job took a lot of training. It took about two years in total, but that’s not a feat every dog can achieve. 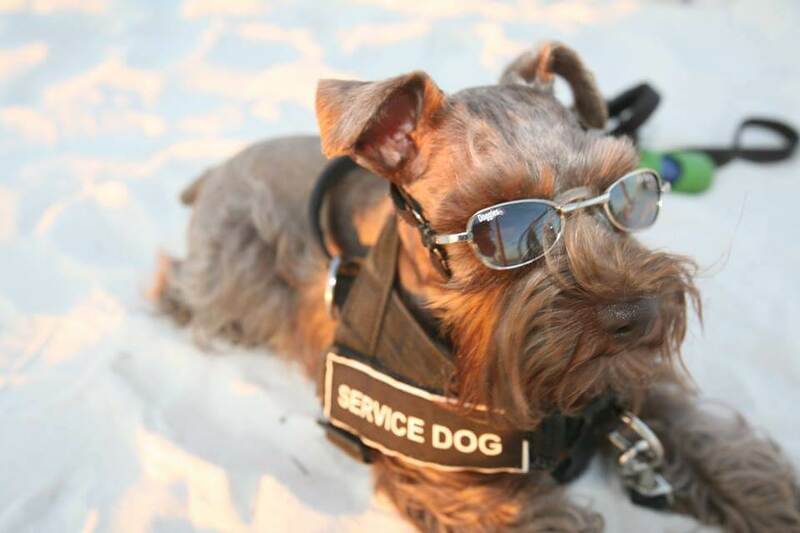 According to The Dodo, just 8% of dogs can meet the tough standards to become a service pup for the hearing impaired. To alert File of an important sound, Finnegan has a few methods. He’ll run back and forth from the source of the sound to his owner (like running to the door and back if the doorbell rings). He also pushes his nose against his hand or mouths and paws at File. Finnegan’s important work isn’t just limited to some hearing help. File suffers from Meniere’s disease. The disease does cause hearing loss, but it also causes symptoms like vertigo which can be dangerous. Finnegan has been trained to alert his dad when an attack is coming before it happens. Usually, he can call an attack between 10 and 30 minutes ahead of time which allows his owner to find a safe place. Ricochet, a Golden Retriever therapy pup is a canine surfing champ. 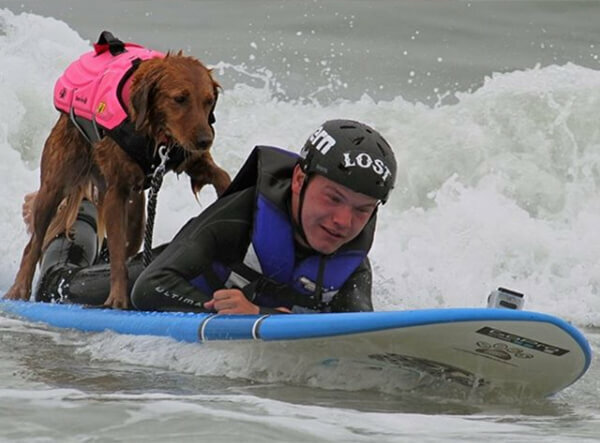 The adorable dog is using her skills in the water to surf with people with disabilities, veterans with PTSD and kids with special needs. On occasion, she even gives some serious surfing lessons, standing on a board with her human pal and helping them catch waves. Ricochet doesn’t just spend her time in the water. The pup has amassed over 100,000 fans on Instagram and used her cuteness to raise almost $500,000 for human and animal rights charities. If that’s not a good girl, what is? Smiley the golden retriever isn’t your average therapy dog. The poor pup was born with no eyes, but that didn’t stop him from helping children in his home of Ontario, Canada. Smiley mostly worked at funerals, comforting kids during the stressful mourning process. He also visited kids with special needs in schools and libraries. 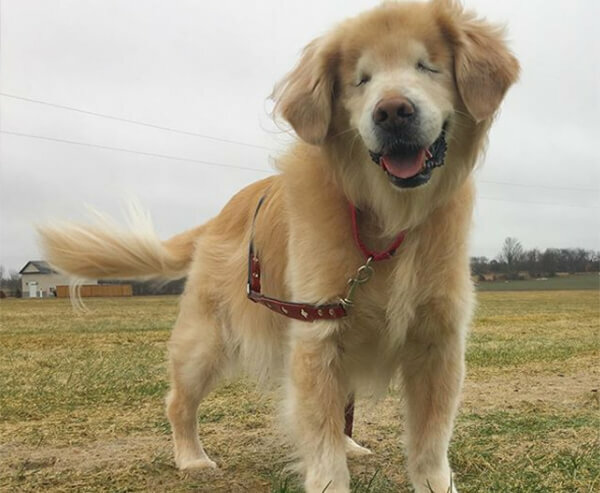 Thanks to Smiley’s unique looks, the differently-abled pup had amassed over 200,000 followers on Instagram and made the world a better place by teaching children everywhere that there’s nothing wrong with being born different. Sadly, Smiley passed away last year. Mojito Rose is more than just an adorable therapy dog. The pup is searching for a cure for canine cancer. She’s participating in the Golden Retriever Lifetime Study as “Hero #1767.” As part of the study, Mojito Rose gets annual checkups that help researchers learn how to diagnose and prevent cancer in dogs. Mojito Rose currently resides in Ohi where he takes on more than just some therapy dog duties. 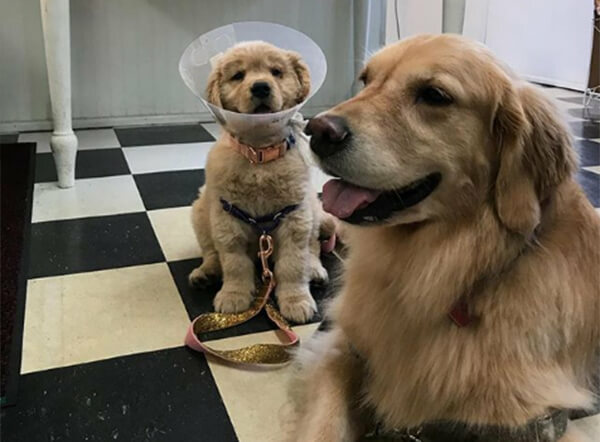 His favorite activities include cuddling up to his feline siblings and offering moral support to his puppy pals who are forced to wear the cone of shame. Service dogs may save lives, but that doesn’t mean they’re immune to silly mistakes. The smart pups have to understand a whole new language because humans don’t speak dog. Don’t you think that’s just a little bit difficult? 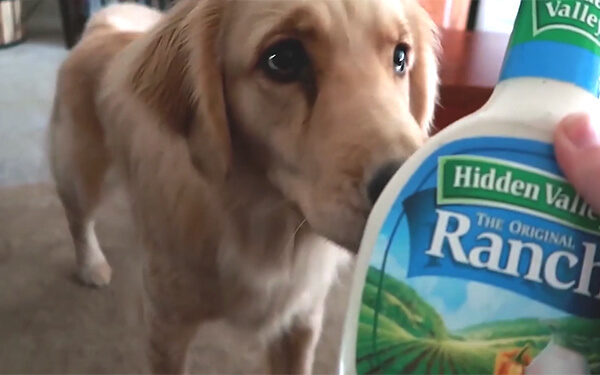 This adorable service pup learned the difference between a bottle of water and a bottle of ranch dressing when she made an adorable mistake. As part of her duties, Harlow fetches things for her owner. She can grab socks, TV remotes and blankets. She can even open the fridge to get her owner a bottle of water. Unfortunately, ranch dressing looks a whole lot like a bottle of water to a pup. When asked to open the fridge and come back with water, she handed her owner some ranch. At least it’s tasty. Everyone who’s ever been to high school knows just how important a yearbook is. They’re memories you’ll treasure forever and any student who’s endured all four years deserves a spot in its pages. This also goes for service pups who’ve worked in the halls to keep their owners safe. 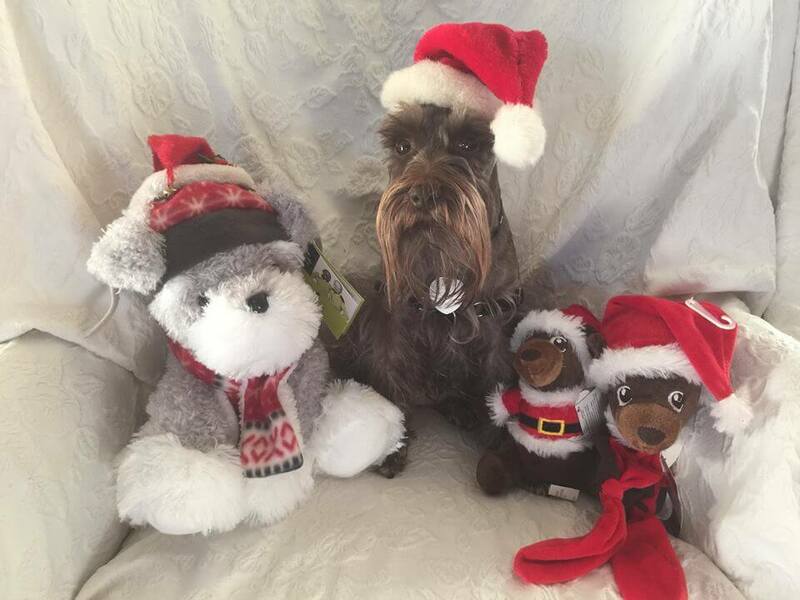 Katie’s owner, Hailee Blonquist, was diagnosed with type 1 diabetes in 2014. Katie was trained to alert Hailee of dangerous drops and spikes in her blood sugar level. 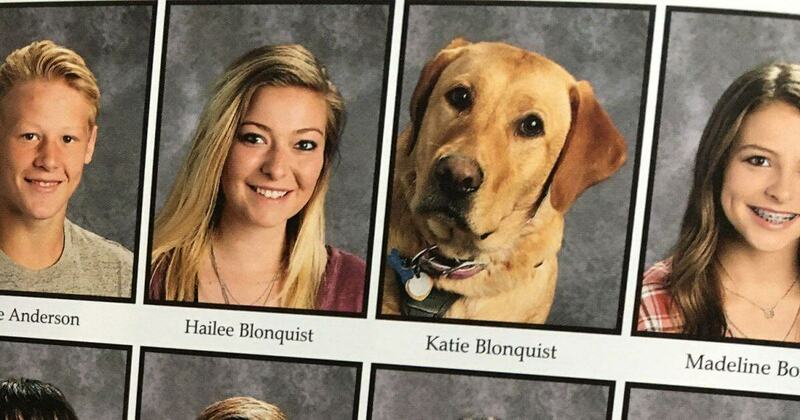 Her hard work earned her a spot in the yearbook when Katie graduated in 2017. The life of a service dog is unpredictable. 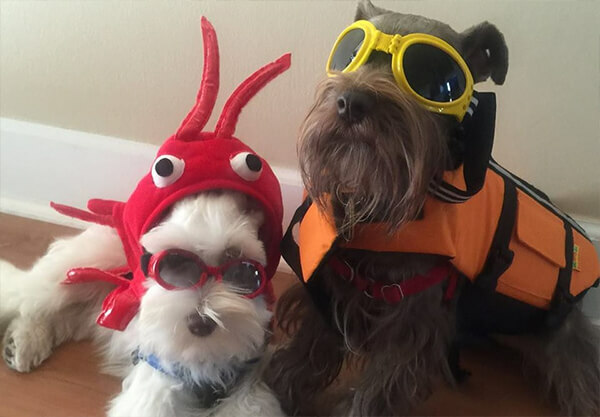 You have to be ready for anything – including having a litter of pups in an inconvenient place. 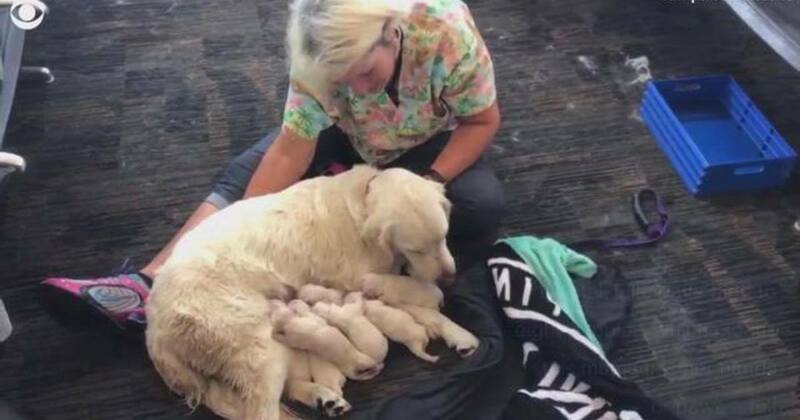 Eleanor Rigby, a golden retriever, surprised her owner Diane Van Attler when she went into labor in a busy airport. The pair was headed home to Philadelphia, PA and were waiting for their flight at Tampa International Airport when Eleanor unexpectedly went into labor. The fire rescue paramedics and a nurse rushed to the dog’s aid and the service pup ended up delivering 7 males and one female. The father, Golden Nugget, was watching proudly from the sidelines. Both Eleanor and Golden Nugget assist Van Attler with her pain and mobility issues, but the tables turned when Eleanor was preparing to deliver the 8 pups. Van Attler was traveling with the pregnant service dog because she didn’t think labor would happen so soon. 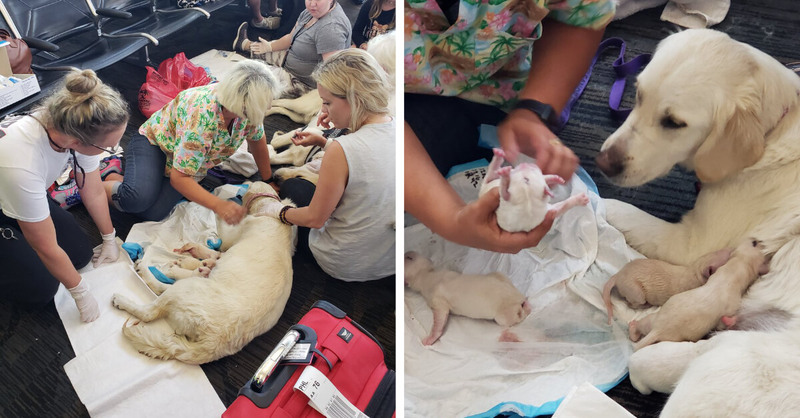 According to her, the bustling excitement in the airport triggered an early labor (and subsequently, caused them to miss their flight, but who cares when you get puppies out of the deal?). Eleanor’s birth was a major spectacle and when the 8 puppies were delivered without any issues, the new mom was met with cheers from bystanders. Needless to say, she’s a very, very good girl. 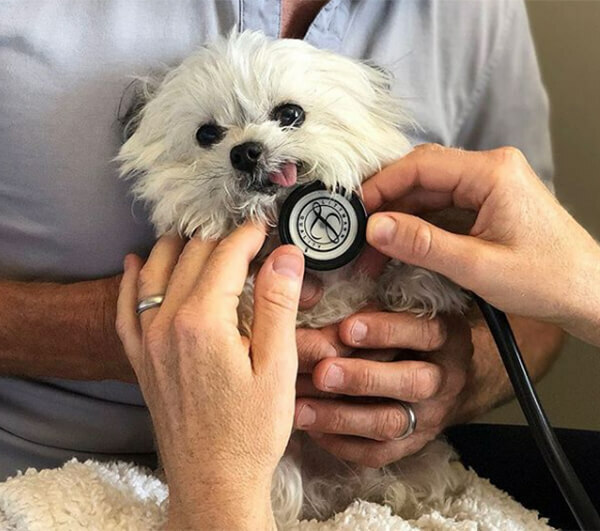 Lentil is a therapy pup who was born different. 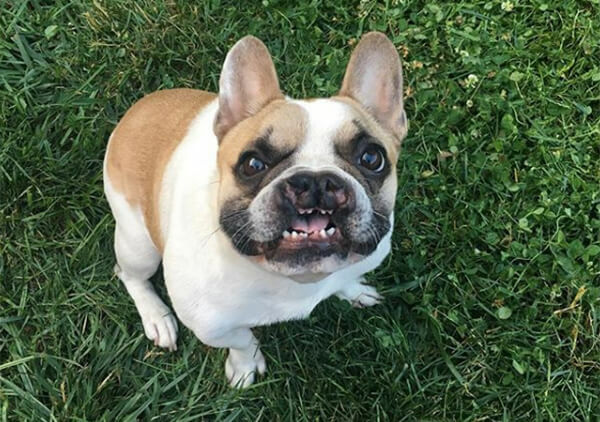 The French Bulldog was born with a cleft palate and lip. Thanks to his birth defect, the therapy puppy has managed to become a close confidante and source of inspiration for children with facial differences. Lentil’s workday usually consists of visiting children’s hospitals and playing with children who have facial abnormalities. He also helps raise money and awareness for the Children’s Craniofacial Association. Lentil’s cute face has amassed more than 15,000 followers on Instagram, where he spreads his message of kindness and embracing his unique looks. Reagan is an adorable labradoodle with a passion for helping families cope with the foster care system. Having to give up a foster kid is bittersweet – they’re going to a permanent home but that doesn’t mean you won’t miss them. Reagan was adopted when he was 8 weeks old to help his mama cope with having to give up her foster children after two years of care – but there were a happy ending and an even more adorable friendship forming beneath the surface. Little did Regan know that he was about to get a brand new brother who needed his love and care. 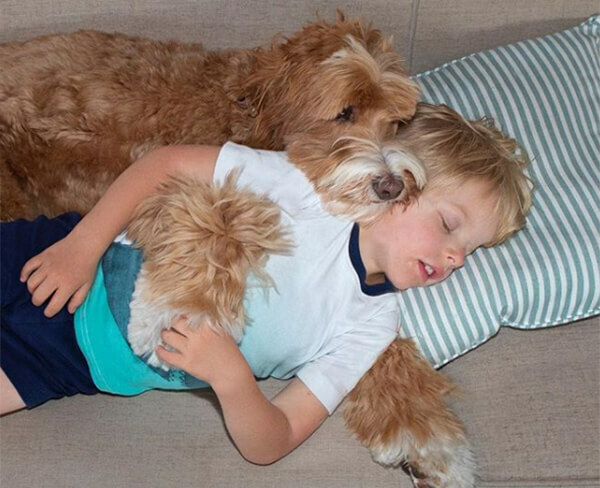 Reagan’s mama adopted Buddy when he was 11 months old, and the therapy pup formed a close bond with the boy. Since then, the pair’s adorable friendship has amassed almost 400,000 followers on Instagram. 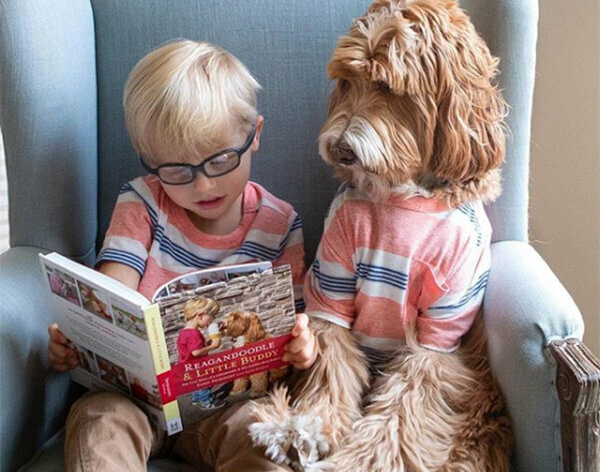 Buddy and Reagan spend their days cuddling and reading books. Naptime isn’t naptime unless Reagan gets to be the big spoon. Their grandmother thought the pair’s friendship was so sweet that she put it in the pages of a book. Reagandoodle and Little Buddy is a true story of friendship and the unbreakable bond within chosen families.